Can’t decide on a luggage to buy? We started LuggageRate to help you that. LuggageRate is your one-stop reviews and comparisons site to help you buy your luggage. We write detailed luggage reviews to save you time, money & disappointment. We purchase and try out all the luggage before deciding whether to it. All reviews and ratings are unbiased and we & the community personally ensure that all content is quality assured. We are luggage reviews and information portal and we do not sell anything. However, we do have a few sources where you can get great discounts and deals on luggage. When travelling, most people often overlook the importance of getting the right luggage and instead just focus on what they should include in their luggage. But imagine that somewhere in the middle of your trip you end up with a dented or mauled bag: or even more inconveniencing, you are forced to pay annoying baggage fees for an outsized piece that barely fits into the luggage compartments provided. All these issues could be avoided if you chose the right luggage that lets you not only travel in style but at peace without worrying about extra fees or damaging and losing your property. So getting the right luggage is important, but how easy is the process? Well, landing the perfect luggage is no easy task but with the right information the task is half solved. You can get information from luggage reviews from previous customers, luggage blogs and any other relevant sources. The key is to be patient and avoid any hasty decisions. Don’t hurry! There is no general rule to the color and style of luggage you should choose. When it comes to color most people choose what pleases them. But there are also advantages of choosing bags of certain colors over others. For instance, bright colors may be easy to spot. But some may opt for darker colors in that they do not show dirt and stains easily compared to bright colors. The shape, design and style of luggage are also factors to consider. Pick a luggage that is well lined on the inside. You may also find a bag with several compartments more convenient than one with just a single large compartment. This is because it allows you organize your things well. The shape of your luggage bag also has some influence. This is because some shapes tend to be more compact and easy to carry around compared to others. The importance of a comfortable and durable luggage cannot be emphasized on enough. This is something that you will be carrying around long distances hoping it safeguards your property and therefore investing in comfort and durability is essential. A comfortable luggage has proper carrying mechanism that make moving it around easy and effortless. Check if the handle is of good length, if the straps are comfortable and whether the feel of the fabric is good to you. Using it should also be comfortable. Check if the closing and opening mechanism is working right. Other things you might consider are how to care and store the bag, can you cope with its demands or are they just too much. When looking at durability, you should consider whether you want just a ‘one time’ luggage or ‘forever’ luggage. If you do not mind a bag that will wear out after a few uses, then you need not invest much. But if you are a frequent traveler and are looking for something to withstand the test of time during all your travel adventures, then you really need to be careful when making your selection. Factors that add up to durability include the material used to make the luggage, the construction method and general workmanship. Most of these things you can observe with your eye and be able to tell just how good the luggage bag is. But just to be sure your choice is good enough, luggage reviews could come in handy. Price is an important consideration whenever you are buying anything. There is a luggage for almost every budget and what you need to do is carry out a thorough research on the market to find what you need at the price you can afford. While the saying goes, ‘you get what you pay for’, that does not always mean that spending more guarantees you the best. Sometimes the market just overprices items for no good reason. And again, if you are patient enough to make a good choice, you could benefit from discounts and offers that could save you some cash. Before setting out to buy a luggage bag, set a budget. This will act as a guide and will help you narrow down your choices. With a few bags to select from know, you can consider any other necessary features you want your luggage bag to have and then choose the bag that offers you the most and the best at your set budget. Again, looking for luggage reviews within a set budget range could help you identify some of the best available options. The size and weight of a luggage really matters in ensuring you have a great travel experience. If you intend to carry lots of things, you will probably not want one that is too heavy. What you might be looking for is a strong, sturdy and light luggage bag that can safely hold up your items throughout your trip. If you get one that is too heavy and big, you will realize that carrying it around especially where there is human traffic will be overwhelming. Also an over-sized luggage may be taking up too much unnecessary space. You may find it difficult finding a place to put it in the flight, bus or even taxi. And as much as you want to minimize on weight and size of your luggage, remember not to compromise on quality. You can read through luggage reviews posted by other customers to find out their experiences with certain luggage bags before you can actually decide on your purchase. Today, you will find bags ranging from backpacks to large suitcases equipped with wheels. The wheels are supposed to make maneuvering your luggage an easy task but this may not always be the case. Some luggage wheels are stiff which makes movement quite frustrating. 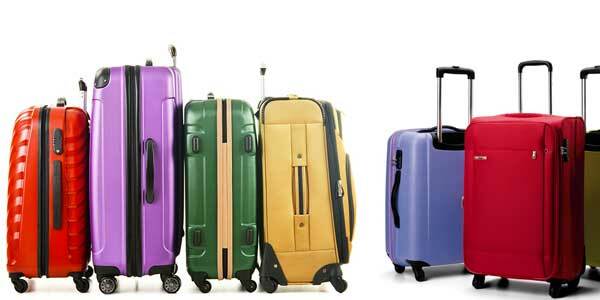 When choosing a luggage bag with wheels, consider picking one that can twist all the way to 360 degrees. This allows for greater control and movement as you drag your luggage along. To ensure that the wheels are reliable enough, you can test them before making your purchase just to be sure enough. Try moving the bag back and forth turning it at different angles and determine how swiftly it responds. If the results are satisfactory, then it is arguably your best pick. Luggage reviews could guide on other wheel types that can act as a good alternative to the 360 degrees spinner wheels. While the above points aim at helping you get the right luggage bag, you can still make use of any other relevant information you find to ensure that the next time you travel, the experience will be pleasant. Also do not forget to look out for any offers and discounts on luggage bags that may be of help to you. LuggageRate is a participant in the Amazon Services LLC Associates Program, an affiliate advertising program designed to provide a means for sites to earn advertising fees by advertising and linking to Amazon properties.